Use forecasting to predict trends in metric graphs based on historical data. Configure the default forecasting options. 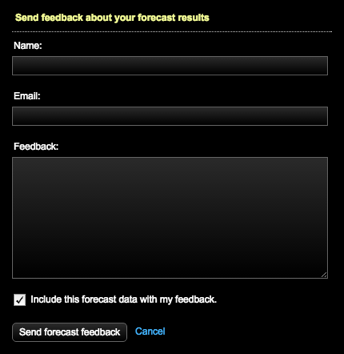 In the Dashboard, locate the metric graph to forecast and click Forecast from the graph menu. The Forecast graph metric dialog appears. Select the date and time for the end of the predicted trend timeframe. The end date and time must be a minimum of two days into the future, up to a maximum of one year. The forecast displays the predicted metric trend for the selected timeframe. 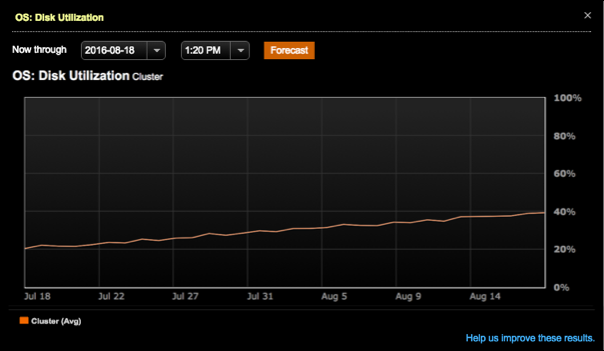 The example forecast above shows that the node disk usage will double from 20% to 40% in one month. In this case, admins should consider adding capacity now. To help DataStax improve your predicted trends, click the Help us improve these results link to forward the results to the DataStax OpsCenter team.